Why is homelessness surging in California? To search for the answer, we’ll follow an inspiring young American that journeyed from the White House to Skid Row, and hear what he learned along the way. We are told the economy is booming, and unemployment is at an all-time low. But something is happening in parts of America that appears to contradict these bits of information. CBS LA Reporter: Well hundreds of homeless people in Orange County now have two options – move out or get arrested. Eyewitness 7 Reporter: Clean up is underway at the homeless encampment along the Santa Ana river trail. The area is now closed for three months for rehabilitation. But nearly one thousand people live here. Angela Peifer: I think it’s gonna be hard to make everybody leave, because we don’t have places to go. Reporter: In a last minute vote that shocked city leaders and home owners, County Board of Supervisors agreed to temporarily house at least 100 homeless in Huntington Beach, at least 200 just south of the great park in Irvine, and more than 100 in Laguna Nigel. Homeless Activist: Right now we’re in a homelessness crisis. If we keep leaving this with out a crisis response, this is what you’re gonna see in every city block in LA. Patrick Courrielche: Homelessness is surging in the home state of Hollywood and Silicon Valley. But why? Why is homelessness surging in California? So even with a booming economy and record low unemployment across certain segments of America, Southern California is facing a spike in homelessness. The problem has surged in Los Angeles. From 2010 to 2017, homelessness grew by 75%. And it’s not only happening in uber liberal La La Land. Orange County, known a Republican stronghold, has been facing an unprecedented homeless crisis as well. But why? Why is homelessness surging in Southern California? To search for the answer, we’ll follow an inspiring young American that journeyed from the White House to Skid Row, and hear what he learned along the way. Patrick Courrielche: Ryan Hampton is the author of American Fix: Inside the Opioid Addiction Crisis…the definitive book on an epidemic gripping our country. His road to author was an unusual one. Ryan grew up in the Sunshine State. Ryan Hampton: You know I came from as much of a normal childhood as you could think although it's hard to say that anybody had a normal childhood. Born in Miami Florida. You know my dad was a stockbroker my mom was a schoolteacher went to two good schools you know went to grow up going to private school in middle school went up to a really good public high school. Never really had a problem with with drugs or alcohol. Patrick Courrielche: He was always striving for more in his youth. He excelled in academics. Started a radio show when he was 16 years old. Became the class president. And was on the swim team. But it was politics that called him. Ryan Hampton: You know I was I was a weird kid after school starting in middle school I got very interested in politics one of my kind of like idols growing up and as weird as it sounds was Ronald Reagan. You know I was excited by politics. I was excited by following it and so I decided to enter and get involved. You know I when I was 13 years old I I spent my days after school from from 5:00 p.m. to to 10:00, 11:00 o'clock at night putting together posters and yard signs for Jeb Bush's first campaign for governor in 1994. Patrick Courrielche: But as Ryan got older, he found his calling in Democrat politics. Ryan Hampton: Then went on to kind of find my own voice and got really involved and took a look at the other side of the aisle and worked for the Clinton re-election campaign and got in really tight with those folks and was able to land an internship my first year of college with the White House which is really where a lot of my political organizing work began. Patrick Courrielche: After his White House stint wrapped up in 2001, he decided to stay in Washington D.C. He’d eventually get a job working at the Democratic National Committee. Ryan’s career was on the upswing. But on an otherwise normal day, the course of his life would take an unexpected turn. Ryan Hampton: And I had a roommate and then right around mid 2003 it's a great trail in between Maryland and Virginia it's pretty famous in the area called the Billy Goat Trail. And I went hiking with my roommate and I it was steep and it was just after it had rained one day and I slipped and I fell and I injured my ankle and my knee pretty much split my kneecap and injured my ankle really really bad. And ended up in the care of urgent care center like a mini ambulatory setting in Maryland. And the doctor said hey listen you know wrap my knee ups and hey you're going to need to get this taken care of. Patrick Courrielche: The urgent care patched up his knee told Ryan he needed to get an MRI. Ryan Hampton: And in the meantime here's a prescription for something that will help with pain and what they prescribe me was hydromorphone which for folks you don't know that's a very high grade opioid. It's also known as Dilaudid. It's basically morphine in a pill. And I took that prescription and I never really went for that follow up appointment. I didn't get the MRI. Did I like the feeling that I got from that from that prescription? Absolutely. Did it take away my pain? Yes. Did it take away a lot of other stuff that was going on in my life. Yes. Did I get the MRI. No. But what did I what I did get was another prescription. Know I went back to that same doctor about a week later she wrote me another script this time for more pills. I went back a third time. She wrote me another script for even more pills. Patrick Courrielche: Because of a simple hiking injury, Ryan was becoming addicted to opioids. The death of his father eventually drew him back to Florida. Ryan Hampton: If you know anything about South Florida in the mid to late 2000s particularly Broward County it was the height of the pill mill crisis. Patrick Courrielche: In the first decade of the 2000s, Florida had been experiencing the rise of pill mills, or pain management clinics that were popping up in Florida. Pharma companies who manufactured opioids in pill form took advantage of Florida’s relaxed regulations by reportedly incentivizing doctors to push opioid prescriptions for pain relief. Ryan Hampton: There were these huge bonuses for them to get into the pain management business. You saw doctors who were coming out of retirement from being OBGYN or I remember having one who was an eye doctor coming out of retirement and getting in into the prescription pill peddling business and it just it just started to take off. Patrick Courrielche: So when Ryan arrived in South Florida, he was entering the worst possible environment for his growing habit…easy access to opioid pills. The drug was taking a hold of him, and he began to exploit this system. Ryan Hampton: And I had gone to my primary care physician and said Hey Doc you know I've got this problem with me and you know it's causing issues and I haven't been able to get it followed up on and my insurance deductible is really high and I'm not sure if I can afford to get surgery right now because of work you know but I need to take away the pain and get he had referred me to a pain management physician and that's where things really began to take off. Patrick Courrielche: His dependence was becoming physical. But strangely the pill mill environment in Florida seemed to normalize his behavior. Ryan Hampton: when I went to that doctor's office that first time and they wrote me that prescription for OxyContin and they wrote me that prescription for Xanax they wrote me that prescription for Percocet. I mean I walked out of that office with three or four bottles full of meds. I kind of felt empowered in a sense as a drug user. I kind of felt like it was cosigned. And it was. And it was very weirdly and oddly accepted too. You know when this when this whole pill mill crisis kicked off it really wasn't shamed and people really weren't talking about it. I mean I can remember at work having my pill bottles on my desk. You know I can remember colleagues asking me if they could have one and you know that it was just different back then. Patrick Courrielche: Over the coming years, he became more and more dependent on the drug. When he needed more drugs than one doctor would subscribe, he began doctor shopping - a practice used by addicts where they find a new doctor to start a completely different prescription regimen. Things started to spiral out of control for Ryan. He became unemployable, and had several bouts with homelessness. In 2006, he tried addiction treatment for the first time. It didn’t work. By this time, the state started to get hip to the pill mill problem. So they decided to do something that would almost instantly kick off the opioid crisis as we know it today. Ryan Hampton: In 2008 you know late 2007 early 2008 the state of Florida decided that they were going to fix this. You know now emerging prescription pill problem that they had the state just felt like it was flooded with opioids. They actually called I-95 which starts down in Key West goes all the way up the East Coast through Kentucky all the way up to New York. They they called that highway Oxycontin Express. Ryan Hampton: They called that highway Oxycontin Express because people would come down from Kentucky come down from West Virginia go down to Broward County. Literally a couple of blocks from where I lived get their medications and then go back up and sell them and whatnot. Patrick Courrielche: Ryan’s neighborhood had become a large distribution center of opioid pills for much of America. By 2008, Americans all across the country had become completely hooked on the pills. So to fix the problem, Florida passed a series of laws to try and stop the madness. They created a statewide prescription database. That way, if an addict began to doctor shop to get more and more pills, the physician could search a database to see if the patient had recently been subscribed opioids by another doctor. But this created an unintended problem. Ryan Hampton: Their intent with this was to just cut the pills off and they thought if they cut the pills off that this problem would stop. I mean we now know what that did. Right. I mean that created this current day opioid crisis. This current day illicit heroin fentanyl crisis. You can't just cut drug users off and then expect them to stop. And that was my story. I mean I lived it. Patrick Courrielche: What Florida didn’t anticipate, was that no one understood the drug market like the South American cartels. El Chapo and his ilk knew that countless Americans were now hooked on opioids. Any change in the laws cutting off the supply of prescription pills would open up a black market for the drug. The cartel was ready and waiting. Patrick Courrielche: The new Florida law tracking drug prescriptions had just went into effect. Ryan Hampton: So I go in. She takes my two hundred dollars cash pulls me into her office and says I can see here in this newly formed database that you're seeing this doctor and that doctor and you've got this prescription and that prescription I remember very clearly. She said you know you're gonna get me arrested I'm going to lose my license you're a drug seeker you're a junkie I don't want you in my office if you come back here I'm gonna have you arrested you know I'm going to put in a trespass order for you and this wasn't just happening to me. This was happening to like everybody it seemed like. I mean that there was like an entire office full of people who were getting discharged that specific day. And I was sick. I mean I was physically dependent on these medications. The power of like making that choice of just stopping had way since passed for me. I was in physical withdrawal. You know I could hardly move. I needed my medication. And when I walked outside of that office that day it was you know not even a split second thought for me to start using heroin. There were actually heroin you know illicit opioid kind of like black market dealers who were right there outside the office peddling heroin and and pills and just selling pills for cash. And that's what I did and that was my descent into heroin. Patrick Courrielche: The cartel predicted a market before it even existed. Literally the day the law restricting opioid pill prescriptions went into effect, heroin was on the streets to fill the void. Ryan Hampton: It was you know a split second thought from someone who had worked in the White House and had this like up and coming career a couple of years prior to becoming a heroin user. Patrick Courrielche: Heroin was everywhere, and it scooped up anyone that was addicted to the prescription opioid pills – which by 2008 had spread throughout the country. The opioid crisis was underway. Ryan had tried several drug rehab centers in South Florida, but they didn’t help. Patrick Courrielche: He eventually made his way out west. Ryan Hampton: I got a job offer out in California while I was you know I had a small brief period where I was sober and Florida came out to California. Job didn't work out. Ended up using again ended up right back where I started on except this time on Skid Row in Los Angeles. Patrick Courrielche: Here Ryan was, someone that had once worked in the White House. Someone who, while trying to be healthy, busted his knee. Someone who was introduced to prescription pain killers – and who’s body told him to take more. Someone who found himself in the epicenter of the pill mill crisis created by Big Pharma…and who was now on Skid Row…perhaps one of the harshest environments for America’s homeless. Unlike the rest of the country that largely provides shelter, the true blue sanctuary city of Los Angeles leaves an appalling 75% of their homeless on the street. In New York it’s only 5%. The environment wore on Ryan. He was sick and tired of living on the streets. He wanted help. Ryan Hampton: I started researching at public libraries you know what treatment was available where they were had opened up dialogue with my my family again really expressed a desire to get help and they didn't have the money to send me to a private kind of shiny five star resort treatment center but they were willing to help me look for one that would take me on on Medicaid or or for free through public service and put my name on on waiting lists multiple waiting lists and towards the end. Those were some of the most terrifying days for me because I didn't know if I was going to make it. And I was constantly waiting for that phone call that I would get a bed. And eventually I did get that bed. Patrick Courrielche: On Thanksgiving Eve 2014, Ryan’s hopes were answered. Ryan Hampton: I did get into a detox for for about five or six days after being you know in that in that particular center for five or six days was kicked out and told that there was no room for me to stay any longer because they had to open up the beds for other people that needed to get Detox. So I was back in that kind of revolving cycle of now where do I go. And was very lucky to find another place. And February 2nd 2015 is when my my recovery began. It was the day that I that I left treatment I hold onto that day because I feel that that's where it really started for me. Patrick Courrielche: He left the treatment center with nothing but two garbage bags full of his belongings. He had no place to stay again, but he got a helping hand. Ryan Hampton: Looking up there was a guy who was also in recovery who who picked me up from the treatment center and got me a bed in a good sober living that they let me stay there for free for some time until I was able to get a job. And you know this was very hard for me. It was incredibly hard for me because I had always thought of myself as someone who is going to go places in life. I had always excelled as a kid. I had always set these expectations within my family and within my community that I would do something big with my life that I would find some sort of purpose and was always chasing after that whether it be for a political campaign or starting a radio show when I was like 16 years old or you know being class president and you know being on the swim team I mean I had goals and so to be really minimized in my head to this point where I had nothing and was just kind of living day to day and on food stamps in the beginning. It was incredibly humbling and very very hard. But I I did it. And you know I just focused on the day ahead of me. And I stayed close to my recovery community and I met some people who I got really really close with my friend Greg my friend Nick you know guys who who I kind of consider myself growing up with because that's really when I grew up is when I entered recovery. Patrick Courrielche: Ryan didn’t have an ah-ha moment that pulled him off of Skid Row. He just had a series of people that helped him string together enough days to begin cleaning himself up. Ryan Hampton: I say I was lucky because I had a peer who picked me up and took me to a safe space a safe recovery house a safe sober living where there are other people who had more time than me who were really trying to do the right thing too. And I hate to say like fake it till you make it but that's kind of how my journey took off like it wasn't this white light moment. It was a lot of other people collectively believing in me when I when I had no faith in myself whatsoever. Patrick Courrielche: The road to recovery for Ryan wasn’t easy. Ryan Hampton: Those first six to eight months of recovery I was I mean I was ashamed. I was silent. My mom didn't want to talk about it. My family didn't want to talk about it. I didn't want anybody to know. You know outside of my small universe that you know I was in recovery and that I had gone through these issues for like the past decade of my life. I just kind of wanted to shut the door on all that and put a big lock on it and just move forward with my life. It was like this big secret that everybody kind of knew but I wanted it to remain a secret it was just kind of like the unspoken truth you know outside of my community. Patrick Courrielche: The shame kept Ryan quiet for a while, but then something happened that would change that. I had become the manager of this sober living at my house at my at the house where I was living at. Patrick Courrielche: The owners thought he presence would make other relapse. Ryan Hampton: But Nick really express this desire to find some help and was terrified and scared and he was only 24 years old. And it was about 8 o'clock at night when he came home and shared this with me and so I spent about three hours that night with him just talking to him just listening to him. And you know when when 10:00 11:00 o'clock came by you know the owner of the House said look you've got to get off the property. So Nick packed up his two bags and we had this. We had come up with this this this this this plan. I said Listen man you know if you do there's an E.R. room about a mile away from here it's one of the best. I said go to this E.R. room go to the you know get in there. Tell him you've got a heroin problem. Tell me you can't stop using aspirin for help. Tell them what you just told me and get some help get treated there. You know get detox for a day to whatever it takes. Call me when you're finished. I'll come pick you up and we'll do it. We'll let you back and we'll do what we do and press the reset button and just keep moving forward. And so that's what he did. He went to that E.R. room he checked in. He got triaged he was in and out of that room within three hours. He was discharged he was given a white piece of paper with a lot of phone numbers on it. They weren't able to to treat him. They weren't able to give him any medication. The E.R. doctors. There was no addiction allergist on staff. They had no idea what to do with him. And they kind of treat them as just like quote unquote a junk you know somebody who really wasn't worth it. And they kicked him out and Nick died that night you know walking back to our house you use one more time and his body was found about four blocks from our house on the on the on the on the sidewalk just slumped over. And that was the moment like nothing absolutely nothing about that scenario sat right with me felt right with me. That here is this young guy who who had gotten close to and really developed this relationship with who wanted help and went to an emergency room to a place that we were taught to trust a place that takes in trauma you know gunshot wounds diabetic attacks heart you know heart attacks and they're able to treat all of these things yet they kick this guy out. This young man with no services and he dies and no one is held accountable. And everybody's just like well that's just it's his fault. He shouldn't have used you know. I mean that that was like the general thought from from folks in the community and I was like wait a second. He went in. He asked for help and he was denied help. And at that moment I knew something had to change. Patrick Courrielche: So Ryan went to his roots. He turned to political organizing and ran to become a delegate to the Democrat National Committee. But Ryan had a problem. Ryan Hampton: And I mean I didn't have two pennies to rub together. Patrick Courrielche: He didn’t think he had a chance of winning, but he thought at least he could rally his community around this overdose crisis. Ryan Hampton: And I went around to sober livings. I went around to treatment centers. I knocked on doors of homes where I knew there were a bunch of recovery folks living there I went to parent groups and I started registering people and I was my my my pitch was something like this. It was like you know are you sick and tired of the overdose crisis. You know I lost my friend Nick. We're not getting funding Look it's what what's happening here something you can do you know registered to vote show up at this elect show up at this caucus. Patrick Courrielche: And Ryan convinced about 100 people from the sober living and treatment center community to show up to the caucus. Ryan Hampton: And when I got there there was this huge line snaked around the Labor headquarters where it was being held there might have been six or seven hundred people there. The 70 candidates had you know they had you know slick flyers and buttons and their kids and you know talking to everybody and everybody knew everybody else and it was me who didn't know anybody that was there and basically all these younger recovery folks who were there and we didn't have fliers we didn't have you know T-shirts made up but we did have a story to tell. And so what I did as I worked that line my friends worked that line. We fanned out all hundred of us and we talked to every single person in that line. And we told them while we were there I told them that you know I've lost my friend Nick and my friend Greg and that you know these people were dying right in our backyard. And this was a story that needed to be told and an issue that needed to be addressed. And I got to tell you I couldn't get 15 seconds into my pitch every second or third person had a story to share with me. You know 72 year old grandmother I'll never forget told me the story of her granddaughter that she lost in Texas six months prior to an overdose. I had a woman whose whose brother was in treatment at that at that very time for alcoholism. Another woman who grew up in an alcoholic household. And it felt as if our community was was waiting for an invitation to talk about this. And we gave that to them. And we had that election. I ended up winning I won big. Patrick Courrielche: In route to the DNC, Ryan went on a cross-country trip to speak about the crisis. He spoke to younger folks in recovery. He spoke to policymakers. The mainstream media wouldn’t give him the time of day, so he turned to social media. Ryan Hampton: You know I I took on Facebook and started a page and on Twitter and within eight months we were reaching 3 4 million people a month who wanted to tell their stories and the platform just kept growing and growing and growing. Patrick Courrielche: By the time Donald Trump won the election, Ryan had build a major platform for the victims of drug addiction. So he was left with a question. Patrick Courrielche: And he did just that. Kelly Anne-Conway: Our next question comes from Ryan Hampton from Pasadena, California. Patrick Courrielche: Amongst other things, he saw stable recovery housing as key to fighting the crisis. And he also identified a particularly evil practice that needed to end…one that was directly targeting vulnerable opioid addicts. Something called Patient Brokering. Patrick Courrielche: I spoke to a couple of people and that turned out to you I'm Alice and I was just wanted to hear. She said that you'd be a good person to speak to. I believe she told me that you might have lost a loved one. I'm not sure. Becki: I lost my son Nicholas last December 10. He was twenty-three. He was out in Los Angeles like go into the rehab and recovery homes. Adryana Cortez: Nicholas grew up in the Lehigh Valley area of Pennsylvania. He was tall. Six foot three, two hundred pounds. As a kid he was outgoing. Becki: He was handsome. He would do anything for you. He had a good heart. And it just all taken away. He had a girlfriend that they were going on for years and that's a long time when you're 23. He wanted to have kids and get married like everybody. A lot of other people do. Adryana Cortez: Right before he started the tenth grade, Nicholas was introduced to opioids. And the way that it happened may sound familiar. Adryana Cortez: Nicholas was prescribed Percocet – which contains oxycodone, an opioid. The pain pills led to heroin use and things began to spiral out of control from there. He began to bounce around to different rehabs – sometimes near his home, and then sometimes in South Florida. And why the bouncing around? He met what is called a patient broker. Pat Aussem: Patient brokering is a phenomenon that basically is getting kickbacks for referrals to different facilities. Adryana Cortez: That’s Pat Aussem, a licensed counselor with Partnership for Drug Free Kids – a national nonprofit that supports families and victims of addiction and substance abuse. Patient brokering is particularly prevalent in Florida and California because of its marketability. Who wouldn’t want to go to those sun drenched states to clean up. Pat Aussem explains the process. Pat Aussem: So basically what happens. And I can give you an example from one of the I ran a parent support group a family support group in my town in New Jersey and one of the moms in the group had sent her son to Florida for treatment. He was in treatment for a while. He left. He relapsed and while he was and then he was back in in detox and went to an AA meeting and at a meeting he met a young man. And you know the first question was actually what kind of insurance do you have. Adryana Cortez: He had the platinum standard in health insurance. Pat Aussem: So the young man said Well look I can get you a really great facility in California and I will fly you out there and I will put you up in a hotel and give you some money for the evening and then we'll get you into detox the next day. So now you've got a kid who actually was working toward recovery who's now on an airplane going to California. Adryana Cortez: His insurance card is shopped around to several California rehab facilities to find the best kickback for the patient broker. Pat Aussem: They finally settled on one he gets out there he goes into a hotel there three other kids there with him. They're given a couple hundred dollars to use for the night. So of course they bought drugs and then went to detox. They were in detox for four or five days and then he said I've got a place you can go to back in Florida for it'll be an intensive outpatient program affiliated with sober living. So that kids back on a plane has you know his insurance is shopped around again. And of course the broker is getting kickbacks and kickbacks are supposedly anywhere from five hundred. I've heard five hundred of five thousand dollars yesterday. I think I heard somebody say ten thousand. Ryan Hampton: I've seen people get paid upwards of 10 15 thousand dollars for one person. Adryana Cortez: Again, Ryan Hampton. Ryan Hampton: so envision a scenario you know somebody who was on the streets homeless like myself goes to addiction treatment they get better they get well they enter recovery you know their first month or two or three they're living in a sober living you know they're working some nine to five minimum bare minimum wage job but they're going to a lot of meetings recovery meetings they're there you know very well known in there and their young recovery world these providers will target those people young in recovery and they'll say hey you know we helped kind of save your life. You know you went You're an alumni of our center. You know here's a way you can make a lot of money you can save someone's life and make some money. And it's the right thing to do. If you come across someone who's in one of these meetings or a friend of theirs or somebody in the community that needs help bring them to me send me their insurance card and I will pay you a commission on that. Adryana Cortez: Predators have been around in the drug treatment world sense the beginning of drug treatment, but it began to explode over the past decade because of a good intentioned program with unintended consequences. Pat Aussem: So as an example this particular mom that I'm referring to talked about how her insurance company was billed twenty thousand dollars for one urine screen. What happens is there was part of the, I believe this is part of the Affordable Care Act. It allowed people to be on their parents insurance until they were 26 require that different screenings be paid for by insurance. Adryana Cortez: Obamacare made certain drug treatments mandatory. Drug screening became covered by insurance – so a drug addicts’ blood and urine became a lucrative pathway for rehabs to bill insurance. A name has even been given to this blood and urine. Again, Nicholas’ mom. Becki: Like the lab work people in that world call it like liquid gold because they contract with the laboratories and charge accounts for like to get there to do a drug test. Adryana Cortez: Testing blood and urine became a major financial opportunity for unscrupulous treatment centers. That’s what happened to Nicholas. An old friend of his had become a patient broker in Los Angeles. Becki: But the kid flew him out there and then he ended up going from house to house kind of. Adryana Cortez: The treatment facilities gave Nicholas quote unquote scholarships to stay at these houses – to bill his platinum health insurance for the blood and urine screening, and more. Becki: And they can go to a partial program or whatever whatever they set him up for and they can bill insurance that way. Adryana Cortez: The patient broker flew Nicholas out to a Los Angeles treatment center in early November 2017, when he landed his insurance was getting billed almost immediately. Becki: we have bills for six thousand dollars that was just bloodwork for one day and his insurance was billed over one hundred thousand dollars for the five weeks that he was out there. Adryana Cortez: Nicholas died of an overdose in Los Angeles while being bounced around in this patient brokering system. Becki: He was supposed to come home and he just didn't make it. They're not the person that's addicted isn't getting placed in the right treatment. They're just getting sent wherever the kickback is for money. And then when the insurance stops paying or they stop getting whatever financial incentive they got for referring the person that they know they're done. So if it's not someone that has money to get back home thousands of miles away and then they're stuck there that's something that I've seen. Adryana Cortez: And so has Ryan Hampton. Ryan Hampton: the homelessness problem today addressing it today you know I live in Southern California it is booming. I mean we have a huge homeless population now particularly in Orange County because what we're seeing is families are sending their loved ones to these treatment centers across state lines that are marketed as these big beautiful shiny places that are going to just fix your kid. They bring them out to Cali and a lot of these these young men and women end up relapsing and end up using again. And what happens is they just boot them to the streets. They just put them on the streets. You know if you walk in L.A. walking downtown L.A. or in Orange County and see homeless folks are homeless kids particularly and you ask them how'd you end up here and I do that. I mean that's that's something that I do. You know seven out of 10 of them will tell you while I came out here for rehab and now and I have no way to get home. Patrick Courrielche: It’s impossible to get an exact number of how many of the homeless in Los Angeles and Orange County are there because of patient brokering. One, because, like illegal immigration, it’s hard to track. People living on the street aren’t in a system. But also like illegal alien crime – law enforcement are largely barred from capturing data on the homeless for fear of litigation. Jordan Graham: We had different municipalities straight up tell us that they avoid tracking this information. Patrick Courrielche: That’s Jordan Graham, a reporter for the Orange County Register. He’s been part of an investigative team that included Teri Sforza, Tony Saavedra and Scott Schwebke, that did a series of deep investigations into how some of the Southern California drug rehab centers were exploiting addiction. Jordan Graham: Addicts are protected under federal ADA laws and so the notion that police would be tracking who are in the community to get help for addiction they see that as potential to a lawsuit. And so no one’s really tracking this data. Patrick Courrielche: Their reporting found plenty of anecdotal evidence that patient brokering was exacerbating an already bad homeless problem. Patrick Courrielche: The rehabs would pay the health insurance deductible because it was far less than the amount they could bill insurance for blood and urine screening. Jordan Graham: and so basically they were flying people then sent signing them up under the state marketplace paying for the deductibles and then just you know doing urine tests every single day you know doing these different procedures that were potentially unnecessary and just you know billing the heck out of different insurance companies for it. Patrick Courrielche: However, anecdotally, Jordan says that patient brokering is likely only exacerbating a homeless crisis that’s being driven largely by a lack of affordable housing. Which brings us back to the question, why is homelessness surging in Southern California? The answer is, homelessness has always been a problem in California because of its weather and California’s failed political policies. But a practice like patient brokering has made an already bad problem that much worse. Florida passed a law outlawing patient brokering, and because of the work of the Orange County Register and Ryan Hampton – Governor Brown signed a law to outlaw the practice as well. Ryan also worked to get this evil practice outlawed on a federal level. Ryan Hampton: This was something I spoke to President Trump about at length and and voiced my concern around patient brokering and at the last minute it wasn't expected to be part of the opioid legislation. But they they did put it in there. The president signed it and it is it is now federal law. Patrick Courrielche: But Ryan says America is only just beginning to address this issue and much more needs to be done. Ryan Hampton: I believe that you know every candidate for president and you know in 2020 if they don't take the opioid crisis seriously if they don't bring our community to the table and talk with us they're going to have a very hard time getting out of the primaries. Patrick Courrielche: Ryan had a parting message for anyone touched by drug addiction. Ryan Hampton: But what I would like to close on and I think is the most important thing is you know all these things I've talked about can't happen and we can't move forward unless people really if they are and I understand is a very personal decision because stigma and shame and discrimination when it comes to folks who are suffering most of them in silence or people in recovery is still very real today. But if you're in a place where you can share your story if you in a place where you can talk about your struggle where you can talk about your recovery or your family's experience. Please do it like please do it. I promise you it is. It is. It is a scary thing to go through but if you're in a place where you can do it for the ones who can't because that's how we're able to get to solutions by standing up putting our hands up and saying that we exist. And in closing if you if you have a family member or a loved one who is struggling with this right now I understand how difficult that is and how hard it is to look beyond that but please don't shut them out of your life. If anything be there just to pick up the phone and listen to them and tell them that you love them because sometimes that's all we have to hang on to when we're out there. Patrick Courrielche: Well Ryan, I guess now’s the time. I’ve always hesitated to say this publicly. But I’ll say it now. My dad was a veteran, a Trump supporter, he was funny. 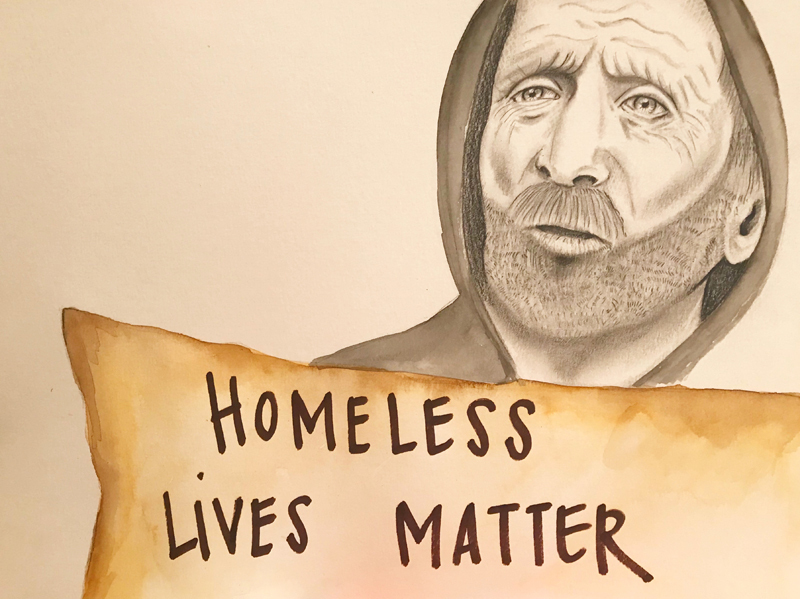 He was also a drug addict, and homeless…homeless for many many years. I tried to help him, but at some point it became too painful. And I cut him off. I forgave him last Father’s Day, but didn’t have the chance to tell him in time. He passed away this past July. Not letting him know I forgave him was one of the biggest regrets of my life…one that I’ll never be able to fix. Luckily, my sister remained his family connection to the very very end. Drug addiction and homelessness is an issue that has touched me personally. And I’m here to tell you, Ryan Hampton is here to tell you, Nicholas is here to tell you, that it can happen to anyone. If we can’t help America’s most vulnerable…what business do we have addressing the other problems of the world. This is a big reason why I’ve supported America First. Not because of racism, or xenophobia, or any of those other slurs that are thrown our direction. I supported because we need to take care of Americans first. And I suspect it’s a big reason why many others have as well. Dad, if you’re listening. I love you. And I forgive you. I hope you forgive me. And to our Red Pilled America listeners, next time you see someone living on the street, please just smile and say hello. They don’t want to be there. Try to think of them as human beings that need help. They could be the next Ryan Hampton. A true inspiration. And let’s do what we can to show them that their lives matter too. Adryana Cortez: If your family needs support, please visit drugfree.org. To learn more about the opioid crisis, please buy Ryan Hampton’s book American Fix. To support the show please visit redpilledamerica.com and click the support button. Red Pilled America is an iHeartRadio original podcast. It’s produced by Adryana cortez and me for Inform ventures. Thanks for listening.